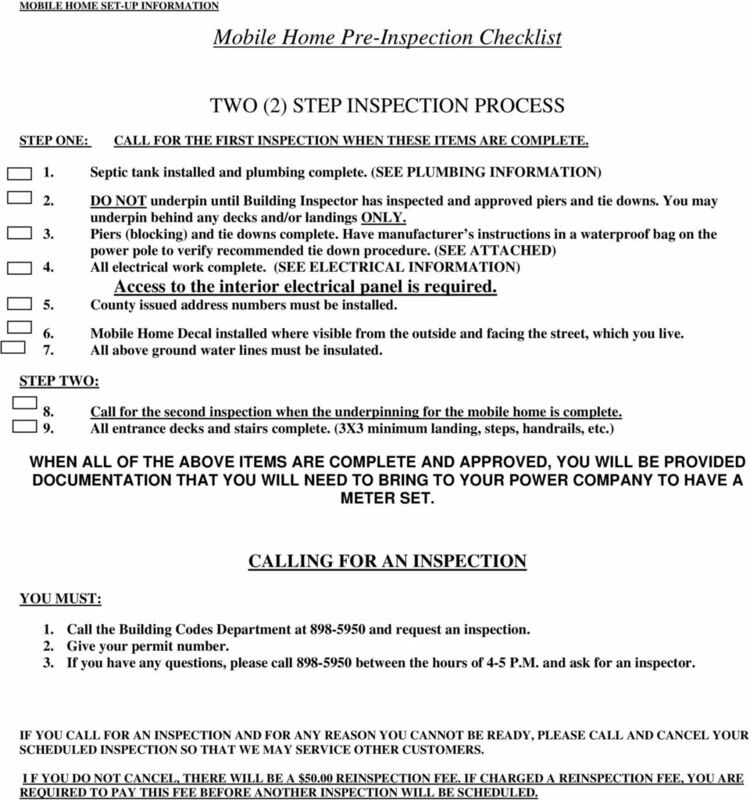 Download "Mobile Home Pre-Inspection Checklist"
2 Mobile Home Pre-Inspection Checklist TWO (2) STEP INSPECTION PROCESS STEP ONE: CALL FOR THE FIRST INSPECTION WHEN THESE ITEMS ARE COMPLETE. 1. Septic tank installed and plumbing complete. (SEE PLUMBING INFORMATION) 2. DO NOT underpin until Building Inspector has inspected and approved piers and tie downs. You may underpin behind any decks and/or landings ONLY. 3. Piers (blocking) and tie downs complete. Have manufacturer s instructions in a waterproof bag on the power pole to verify recommended tie down procedure. (SEE ATTACHED) 4. All electrical work complete. (SEE ELECTRICAL INFORMATION) Access to the interior electrical panel is required. 5. County issued address numbers must be installed. 6. Mobile Home Decal installed where visible from the outside and facing the street, which you live. 7. All above ground water lines must be insulated. STEP TWO: 8. Call for the second inspection when the underpinning for the mobile home is complete. 9. All entrance decks and stairs complete. (3X3 minimum landing, steps, handrails, etc.) WHEN ALL OF THE ABOVE ITEMS ARE COMPLETE AND APPROVED, YOU WILL BE PROVIDED DOCUMENTATION THAT YOU WILL NEED TO BRING TO YOUR POWER COMPANY TO HAVE A METER SET. YOU MUST: CALLING FOR AN INSPECTION 1. Call the Building Codes Department at and request an inspection. 2. Give your permit number. 3. If you have any questions, please call between the hours of 4-5 P.M. and ask for an inspector. IF YOU CALL FOR AN INSPECTION AND FOR ANY REASON YOU CANNOT BE READY, PLEASE CALL AND CANCEL YOUR SCHEDULED INSPECTION SO THAT WE MAY SERVICE OTHER CUSTOMERS. I F YOU DO NOT CANCEL, THERE WILL BE A $50.00 REINSPECTION FEE. IF CHARGED A REINSPECTION FEE, YOU ARE REQUIRED TO PAY THIS FEE BEFORE ANOTHER INSPECTION WILL BE SCHEDULED. 3 IV. Mobile Home Set-up 1. Underpinning and proper ventilation is required for all mobile homes. 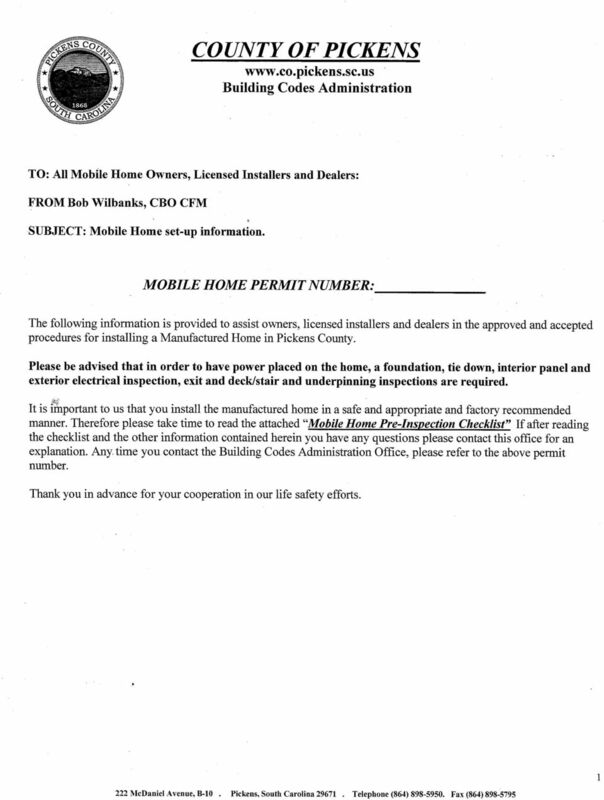 Pickens County Development Standard Ordinance #304 states that all mobile homes must be properly underpinned before the Certificate of Completion is issued. Therefore, all underpinning must be completed before the power can be released to the home. A. Underpinning and skirting: 1. Ventilation requirements must be met. 2. Shall be underpinned with brick, concrete block, vinyl, or continuous aluminum or fiberglass skirting extending to the ground around the perimeter of the mobile home. 3. R Access: An access crawl hole 18 inches by 24 inches shall be provided to the under floor space. B. Ventilation: 1. 1 square foot of ventilation is required for every 150 square feet of floor area of home. Example: A Mobile Home that is 14 feet wide by 70 feet long. 70 feet long minus the 4 foot hitch = 66 feet and a typical vent is 60 square inches 66 feet x 14 feet = 924 square feet of floor area 924 square feet divided by 150 square feet per vent = 6.61 square feet of venting required square feet X 144 square inches per 1 square foot = 887 square inches of required ventilation. 887 square inches divided by 60 square inches per vent = or 15 vents required. 2. Vents must be located within 3 feet of each corner of the mobile home and can have operable screen louvers or mesh not less than 1/8 inch and not more than 1/2 Inch in any dimension. 3. Moisture producing devices such as dryers shall be vented to the outside beyond the perimeter of the home. 2. 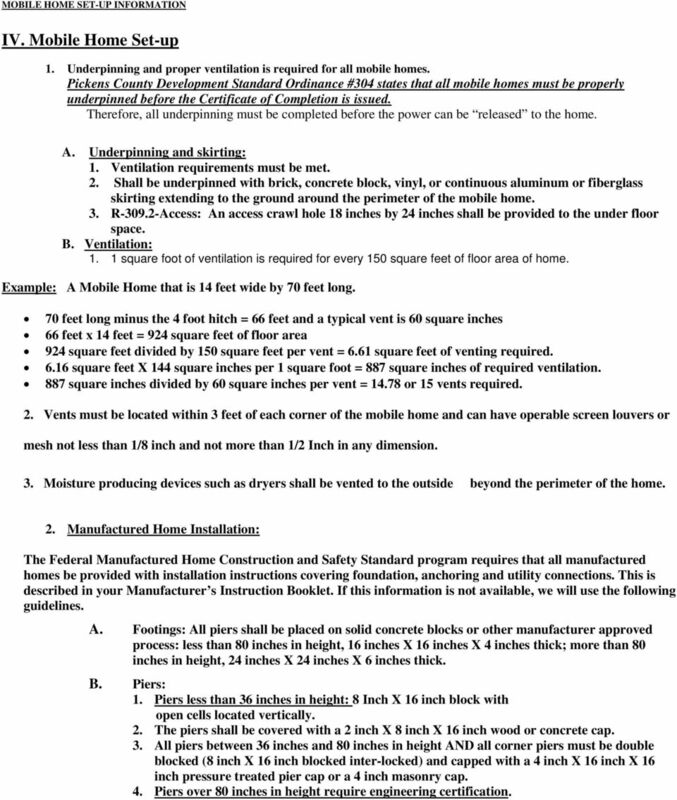 Manufactured Home Installation: The Federal Manufactured Home Construction and Safety Standard program requires that all manufactured homes be provided with installation instructions covering foundation, anchoring and utility connections. This is described in your Manufacturer s Instruction Booklet. If this information is not available, we will use the following guidelines. A. Footings: All piers shall be placed on solid concrete blocks or other manufacturer approved process: less than 80 inches in height, 16 inches X 16 inches X 4 inches thick; more than 80 inches in height, 24 inches X 24 inches X 6 inches thick. B. Piers: 1. Piers less than 36 inches in height: 8 Inch X 16 inch block with open cells located vertically. 2. The piers shall be covered with a 2 inch X 8 inch X 16 inch wood or concrete cap. 3. All piers between 36 inches and 80 inches in height AND all corner piers must be double blocked (8 inch X 16 inch blocked inter-locked) and capped with a 4 inch X 16 inch X 16 inch pressure treated pier cap or a 4 inch masonry cap. 4. Piers over 80 inches in height require engineering certification. 4 LENGTH OF HOME TIE DOWNS AND ANCHORS: A B C D # OF VERTICAL # DIAGONAL TIES TIES PER SIDE MINIMUM NO. OF ANCHORS UP TO TO TO TO TO TO TO TO TO a. Double section manufactured homes require only the diagonal ties specified in column C. b. Length of manufactured home (as used in the above table) refers to length excluding the draw bar or tongue. c. Double sections will be bolted together by manufactured requirements. d. Open hook ends shall not be used in any part of the anchoring system. e. Anchors need to be at ground level. 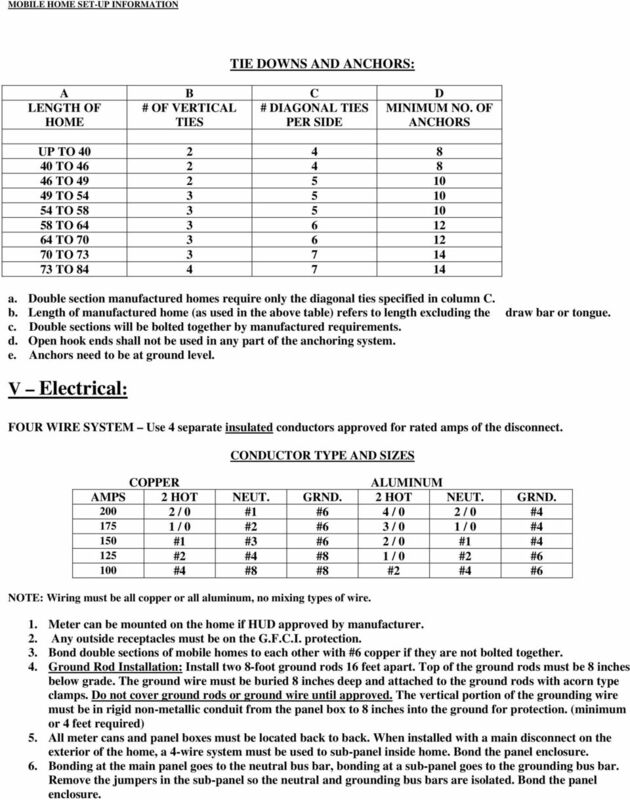 V Electrical: FOUR WIRE SYSTEM Use 4 separate insulated conductors approved for rated amps of the disconnect. CONDUCTOR TYPE AND SIZES COPPER ALUMINUM AMPS 2 HOT NEUT. GRND. 2 HOT NEUT. GRND / 0 #1 #6 4 / 0 2 / 0 # / 0 #2 #6 3 / 0 1 / 0 #4 150 #1 #3 #6 2 / 0 #1 #4 125 #2 #4 #8 1 / 0 #2 #6 100 #4 #8 #8 #2 #4 #6 NOTE: Wiring must be all copper or all aluminum, no mixing types of wire. 1. Meter can be mounted on the home if HUD approved by manufacturer. 2. Any outside receptacles must be on the G.F.C.I. protection. 3. Bond double sections of mobile homes to each other with #6 copper if they are not bolted together. 4. Ground Rod Installation: Install two 8-foot ground rods 16 feet apart. Top of the ground rods must be 8 inches below grade. The ground wire must be buried 8 inches deep and attached to the ground rods with acorn type clamps. Do not cover ground rods or ground wire until approved. 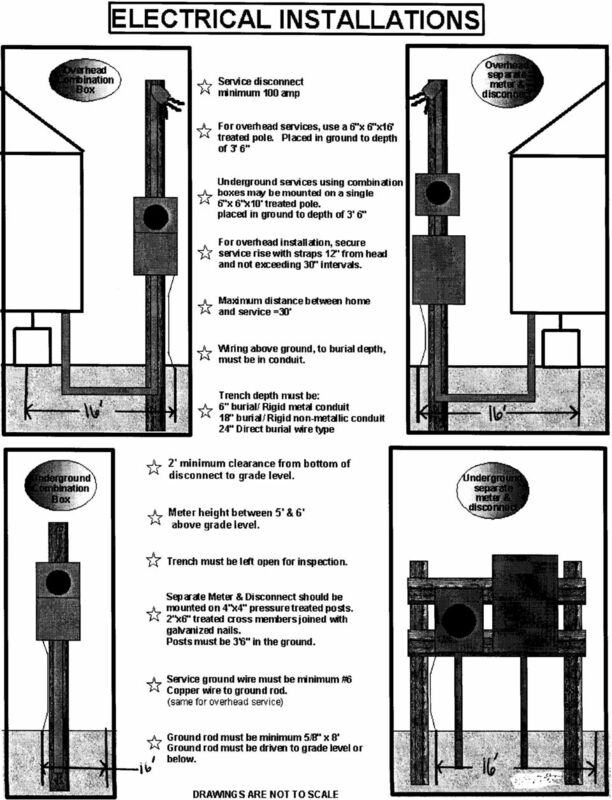 The vertical portion of the grounding wire must be in rigid non-metallic conduit from the panel box to 8 inches into the ground for protection. (minimum or 4 feet required) 5. All meter cans and panel boxes must be located back to back. When installed with a main disconnect on the exterior of the home, a 4-wire system must be used to sub-panel inside home. Bond the panel enclosure. 6. Bonding at the main panel goes to the neutral bus bar, bonding at a sub-panel goes to the grounding bus bar. Remove the jumpers in the sub-panel so the neutral and grounding bus bars are isolated. Bond the panel enclosure. 5 VI Plumbing: 1. All plumbing installed shall conform to the 2003 International Plumbing Codes International Plumbing Code requires that all plastic water service piping shall be rated for a minimum working pressure of 160 PSI or better and sized 3/4 inch or larger and must be insulated International Residential Code requires water service lines shall not be in the same ditch as the sewer line unless they meet code requirements. 4. No water service may pass over or through any septic tank or its drain field. 5. The water distribution system shall be protected against backflow with a Backflow Prevention device. 6. A separate service shut-off valve shall be installed on the water line at the supply side located near the mobile home. 7. Where water pressure in the home exceeds 80 PSI, a water pressure-reducing valve must be installed. 8. Water line must be 18 inches below grade from meter to home. 9. Any above ground water line must be insulated. 10. A clean out for routing out a plugged sewer septic line must be installed with-in 5 feet of the mobile home and visible. VII General Building Requirements: 1. County provided home numbers (911 Number) Size Requirements Residential Numbers Minimum 3 inch in height Business Numbers Minimum 4 inch in height All numbers must contrast to the color of the building and be readable from the road. Buildings more than 50 feet from the road must also have numbers near the road (on your side of the road) such as on a mailbox, on a 4X4 treated post or in another appropriate place. 2. The grade away from the mobile foundation shall fall a minimum of 6 inches within the first 10 feet. 3. 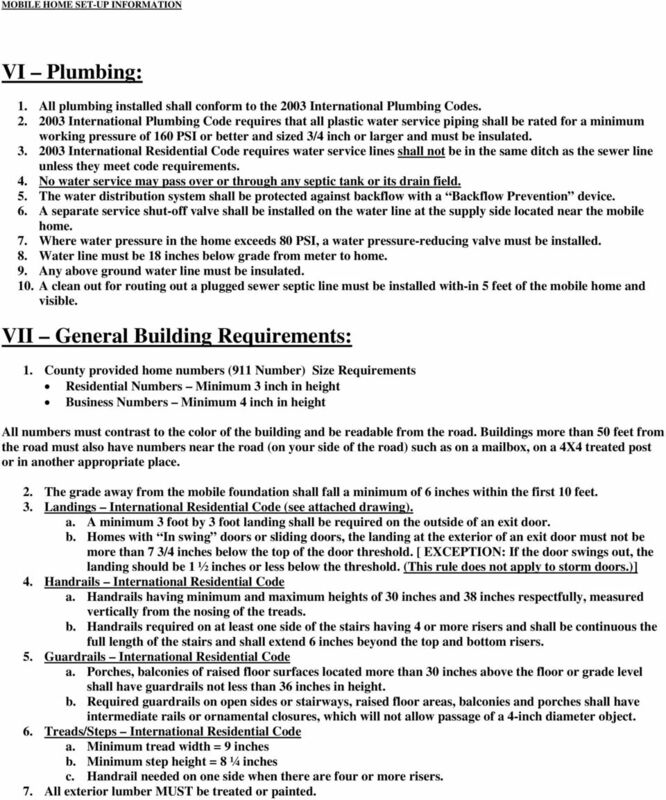 Landings International Residential Code (see attached drawing). a. A minimum 3 foot by 3 foot landing shall be required on the outside of an exit door. b. Homes with In swing doors or sliding doors, the landing at the exterior of an exit door must not be more than 7 3/4 inches below the top of the door threshold. [ EXCEPTION: If the door swings out, the landing should be 1 ½ inches or less below the threshold. (This rule does not apply to storm doors.)] 4. Handrails International Residential Code a. Handrails having minimum and maximum heights of 30 inches and 38 inches respectfully, measured vertically from the nosing of the treads. b. Handrails required on at least one side of the stairs having 4 or more risers and shall be continuous the full length of the stairs and shall extend 6 inches beyond the top and bottom risers. 5. Guardrails International Residential Code a. Porches, balconies of raised floor surfaces located more than 30 inches above the floor or grade level shall have guardrails not less than 36 inches in height. b. Required guardrails on open sides or stairways, raised floor areas, balconies and porches shall have intermediate rails or ornamental closures, which will not allow passage of a 4-inch diameter object. 6. Treads/Steps International Residential Code a. Minimum tread width = 9 inches b. 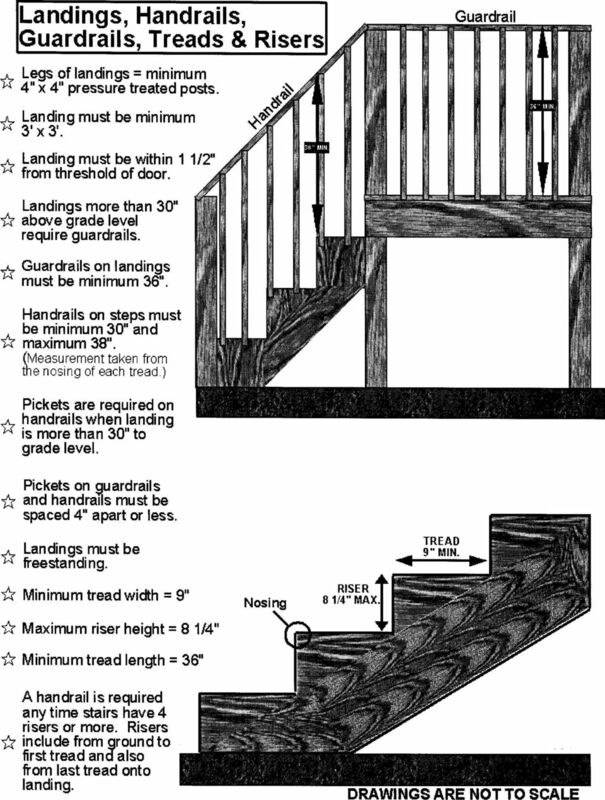 Minimum step height = 8 ¼ inches c. Handrail needed on one side when there are four or more risers. 7. All exterior lumber MUST be treated or painted. The purpose of this document is to provide standards for persons requesting or subject to County building inspections. CITY OF FAIRFAX CODE ADMINISTRATION 703-385-7830 / FAX 703-385-9265 www.fairfaxva.gov Finishing a basement to make additional living space in a house is a popular construction project for many homeowners. Basement Development Construction requirements for the development of basements in residential dwellings. Please check with your local inspection authority for any additional requirements before installation. 3. Contractor shall ensure that all permits are obtained prior to any construction. Contractor shall be responsible for all utility fees. www.citiesinspection.com October 5, 2015 Dear Client, On 9/14/2015, Cities Inspection Service, Inc. completed a building inspection of the property located at 123 Oak Street, Someplace, Minnesota for you. This handout is a guide only and does not contain all of the requirements of the Minnesota State Building Code or city ordinances. Building Condition Assessment Report Asset C3c - Oak Terrace Cottage 121 Address Riverview Lands, 2601 Lougheed Highway, Coquitlam, BC. V5C 4J2 Construction Year Size (Gross Floor Area) 1920. 2,553 Sq.Ft. Mark Cramer Inspection Services, Inc. WINDOW AND DOOR REPLACEMENT REQUIREMENTS Should you have any questions after reading the following information, please call the Building Inspection Department at 651-439-4439 to discuss the topics of concern. COST OF WORK FORM All costs shown are estimates using base grade materials, taxes, and labor. For houses where a higher quality is indicated, the costs should be increased for work requiring upgraded materials. Inspecting to a higher standard.